Alright so I have to admit that the first time I tried on this Clyde Billow Skirt from Elizabeth Suzann I was not a fan. It felt way too voluminous and I thought it made my mid-section look puffy because the skirt billowed out (well no duh, it's in the name). I have never owned or worn a skirt like this before in my life. It almost felt like a costume skirt from a theater piece. But when I polled this skirt on Insta-stories, so many people specifically DM'd me to tell me that they liked it (and that I should keep it). And so with some peer pressure and enabling, I decided to give this skirt a good shot (plus I knew if I ended up really disliking it, I could always sell this skirt on the secondhand market with just a small loss). The second time I wore it I liked it a little bit better. And now? I loooooove it. Funny how that happens. 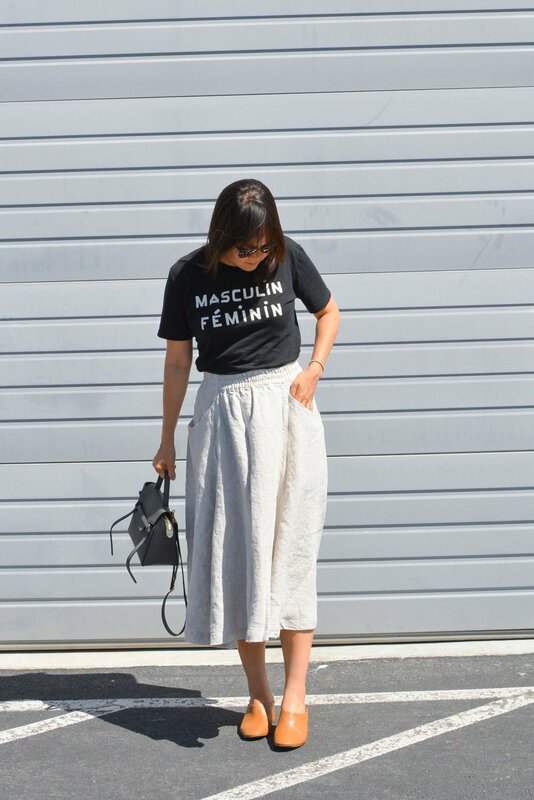 - First and foremost it's a really well-made skirt with a ton of linen material. 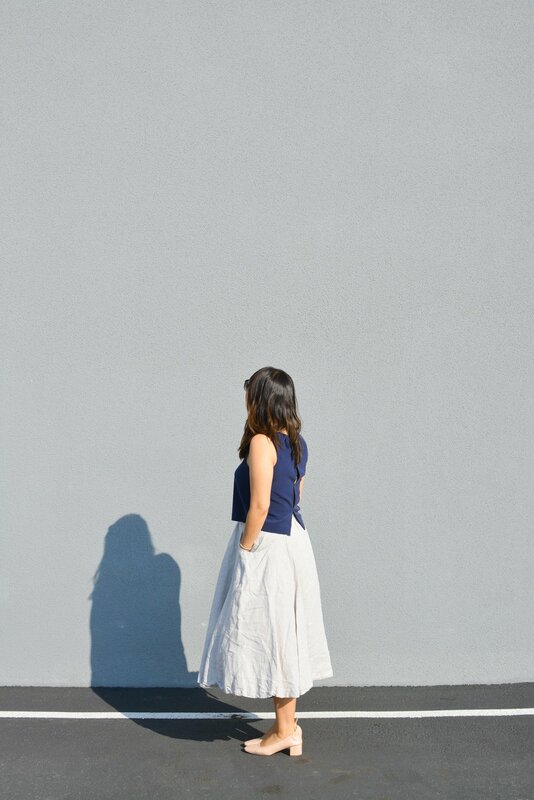 Linen isn't heavy (and I wouldn't call this skirt heavy), but with the amount of linen used in this skirt, this skirt is substantial. Seriously, I don't think any other brand would use so much material for just one piece of clothing. 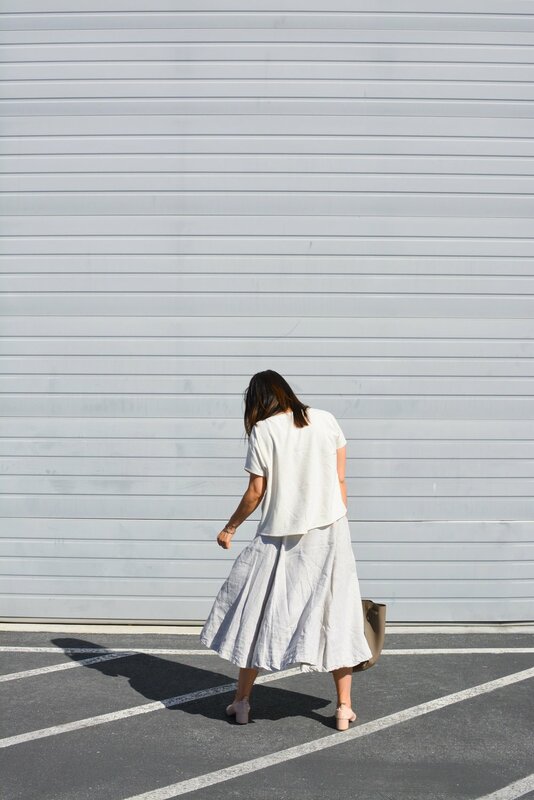 - And all that linen is what makes the billow of the skirt, which makes it so fun to wear. 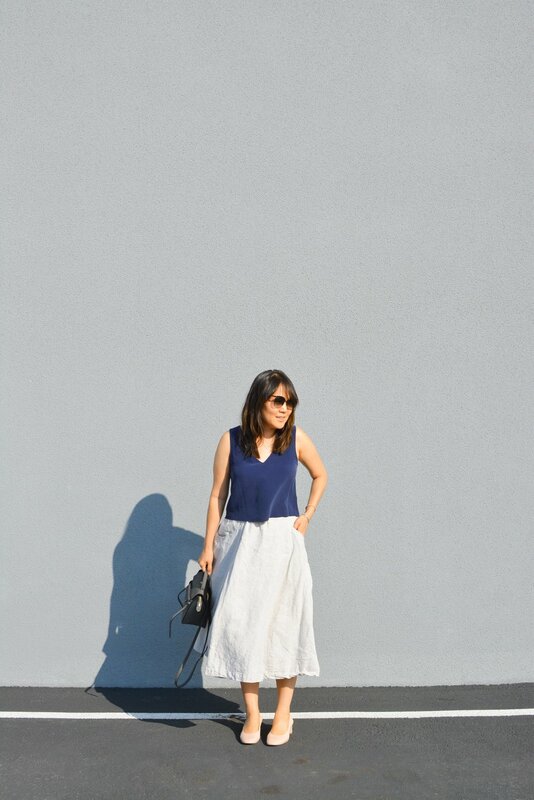 What girl doesn't like twirling around in a voluminous skirt? - The flax linen material is so gorgeously textured and 100% opaque. Also due to the billowiness and the slight wrinkliness of this linen, any dark spots or stains are hard to see (which happens a bit for me whenever I brush up against something in the Airstream garage). - Like all my Clydes, I love love love the pockets. 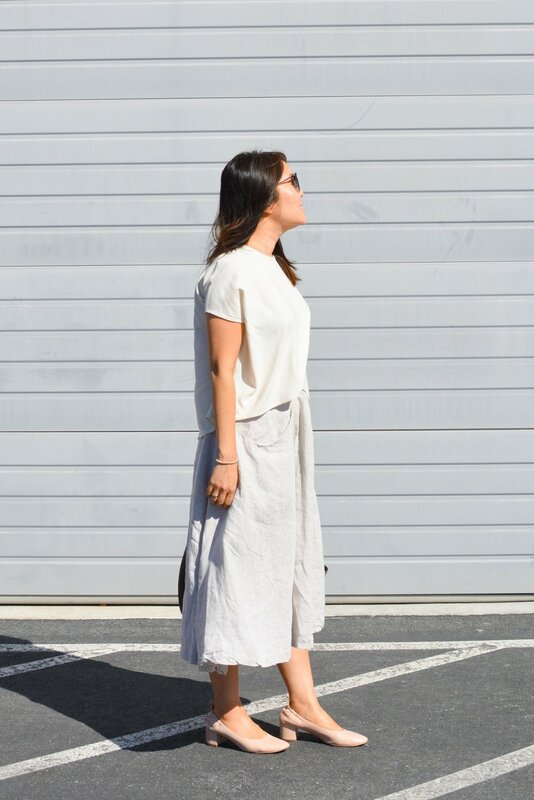 These skirt pockets can hold anything and everything. I'm wearing a size small here (I'm a 28 waist and a 37 hips, usually a size 4-6). The first time I wore it I had to shimmy it over my hips a bit. But after washing and wearing for a month the elastic waistband loosened enough so that it's not as tight over the hips. I'm 5'4" and find the length a tad long and so I wear heels with this skirt to keep my legs from looking stumpy. I might try to take the hem up a tad just so it's a tad shorter than the current midi length. I think part of the reason I didn't like it at first, was that this is also not my usual style. I don't normally wear big puffy skirts. So this could just be another example of how slow fashion changed my style. But now I love it because this skirt feels so unique and special. 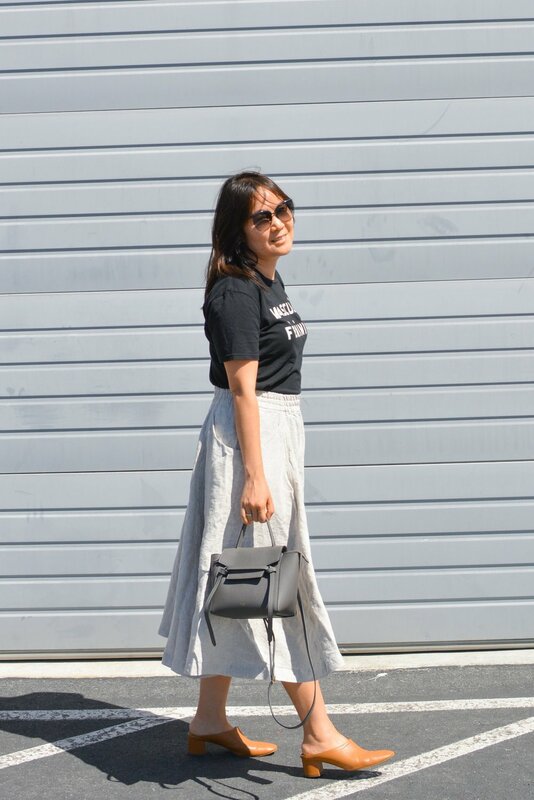 Also by pairing it with more cropped tops or tucking in a shirt, I think it balance out the volume on the bottom. Also, the puffiness of the skirt goes down a bit once you wash it and don't steam press out the wrinkles. The photos above, where I'm wearing it with the Alta top, is the skirt right after washing (though I hung it to dry). So it's a tad wrinkly but also when I wore it, it felt less voluminous (and I prefer it that way). The one thing I noticed about really good linen is that after you wash it, you don't need to press it. There's not major wrinkles and instead the linen just looks textured and casual. In fact, I think it's better to leave it slightly rumpled. So what do you think? Did I make the right decision to keep it?